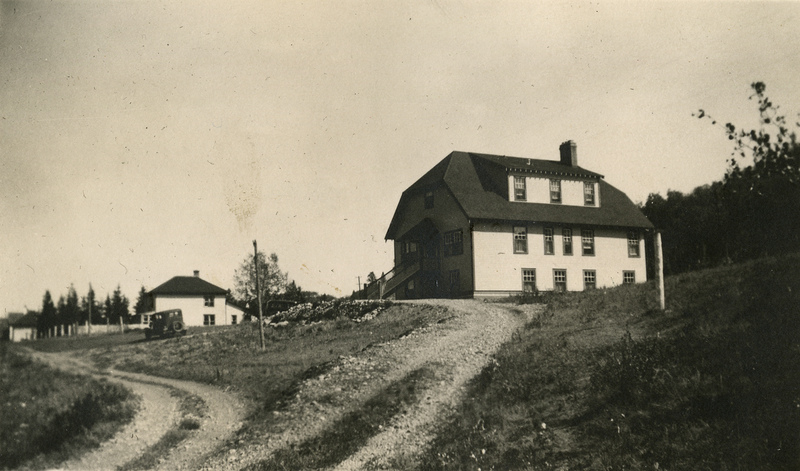 Feb. 29 – General inspection a few miles north of Lingfield. Gen. Montgomery gave his usual address. Everything went off well. 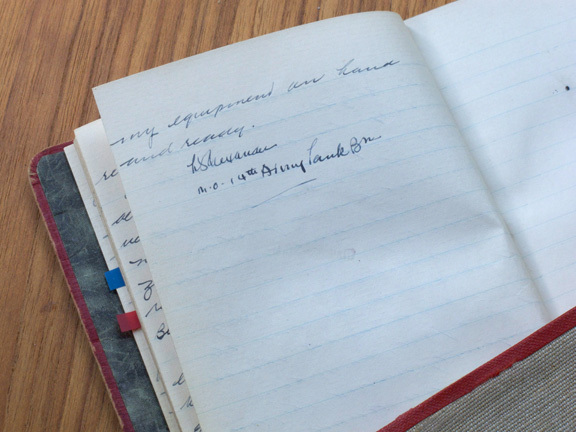 March 2, 1944 – We had a dance for the men in their mess hall. This was largely an experiment but went off a hundred percent. We are planning on another next Thursday night. Yesterday Lt. Dibb and I went to Woking where we met Col. Hazard and proceeded to the 3rd Cacru where I lectured to the Officers and then gave a demonstration of my jeep. 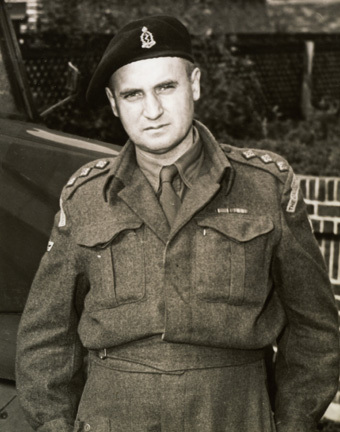 Later gave a demonstration to the 3rd Div. March 3 – Went with 3rd CC (Maj. Patterson) to a rendevous for a general inspection next week. On Monday I go to a medical meeting in London. On Wednesday I lecture to 3rd CCS. I am now waiting for Timmy Cameron to arrive. He will spend the weekend with me. Timmy arrived at Dormans station and I met him in a jeep. We went to East Grinstead for the evening. March 4 – Rus. 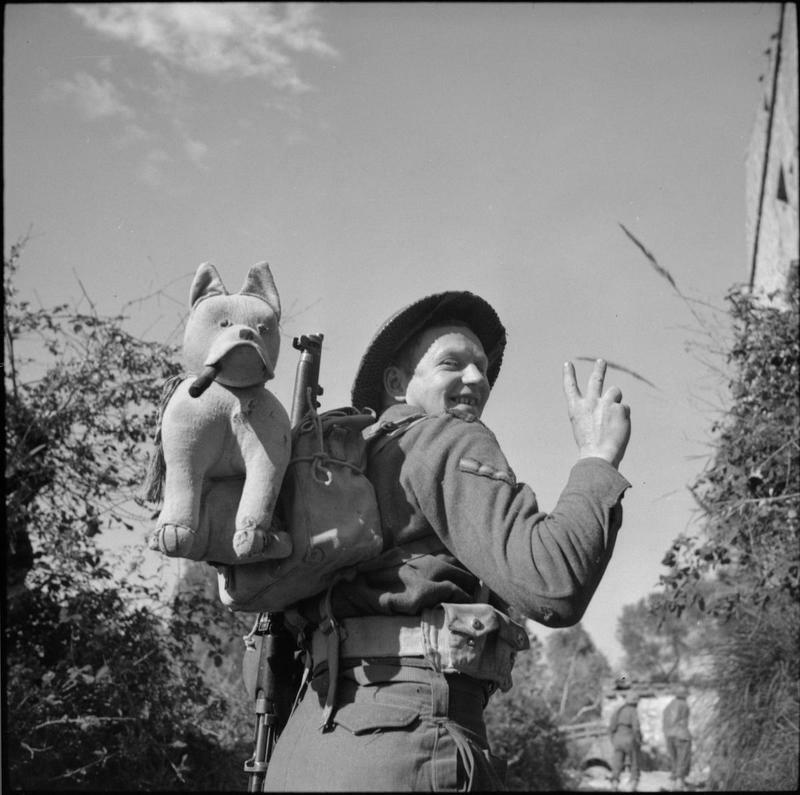 Noble (of 4th Div.) phoned for Tim and I to meet him in Burgess Hill. we took a jeep and went over. Molly Hunt (Bill Hunt’s wife) was there and a Jean Black from Toronto, also Major … ? from 4th Div. workshop. We went back to his Mess for lunch then back to Russ’s Mess for dinner. It was grand to see them all again. The old Army Tank Brigade in force. March 5 – I took an early morning train to London to attend the Royal Society of Medicine meeting. Met a lot of chaps I knew. Came home late the same night. Timmy’s brother-in-law called for him during the day. It was a grand weekend. March 6 – on another meeting with 4th Div and 2nd Corps – in final preparation for the inspection by the King which will take place on the 9th of March. March 7 – Was at Corps H.Q. for a medical meeting. March 8 – Gave a lecture on Sicily and Italy to 3 CCS today. This afternoon I go to Lewes to see Capt. Fleetwood (Eng), an old friend of mine from 14th days. I am trying to find a suitable place for going under canvas. Tomorrow will be a heavy day. The King’s inspection. Meanwhile in Italy: Unidentified personnel of the Saskatoon Light Infantry (M.G.) 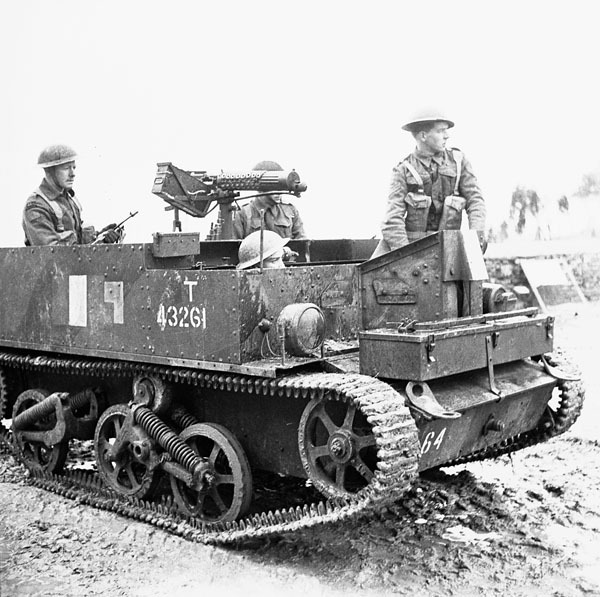 in a Universal Carrier equipped with a Vickers machine gun, Italy, 8 March 1944. What do a First World War bugle, three Second World War daggers and a bayonet, a silk escape map and a Zippo lighter (not to mention a pile of badges and other insignia) have in common? 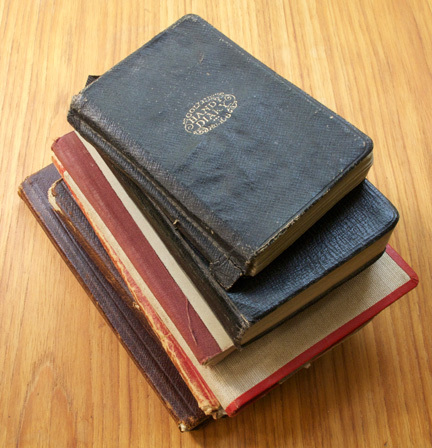 They all belonged to my grandfather – Doc Alexander – and have been passed on to me via my uncle, Don, and his brother, my dad, Bob. It’s a veritable treasure trove and I’m really excited as I have the mate to two of the daggers and have never seen the other two, one of which is a German bayonet. My grandfather did not play the bugle during the First World War. 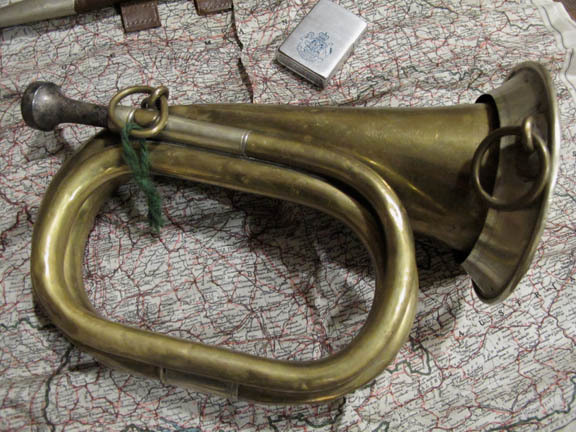 He was in a mortar unit and then served as a stretcher bearer, but somehow, he came to have this beautiful, but very battered bugle in his possession. Along with all of that is a King’s Own Calgary Regiment Zippo lighter from 1950 that has obviously been well used. I’m not a smoker, never have been, but there is something about flicking a Zippo lighter open and closed. It’s incredibly satisfying, especially knowing that my grandfather would have done the same thing with it. The silk escape map is of Germany and some of the badges would have been on his uniforms at different times during the war. The two white rams lying on the escape map can be seen in a photograph of my grandfather taken in his Regimental Aid Post in Seaford, England early on in the war. The rams were early insignia of the Royal Canadian Armoured Corps. I’m a pack rat by nature and I love old objects, so I’m thrilled to have this little treasure trove of my grandfather’s fall into my lap and many thanks to my uncle for passing it on to me! 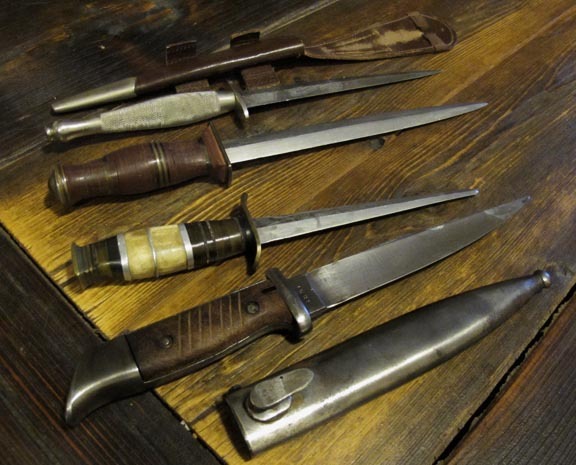 Commando daggers and a German bayonet (front). 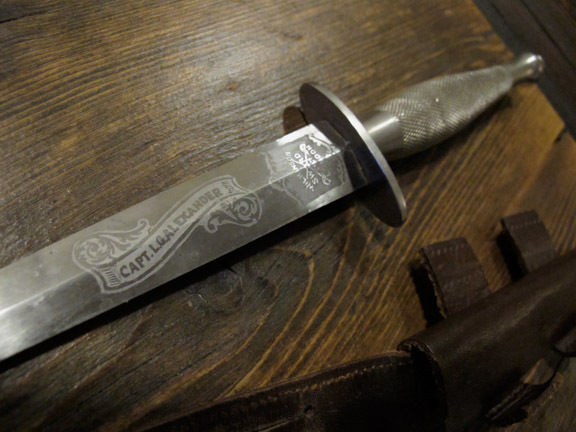 Doc Alexander’s name emblazoned on one of the commando daggers. 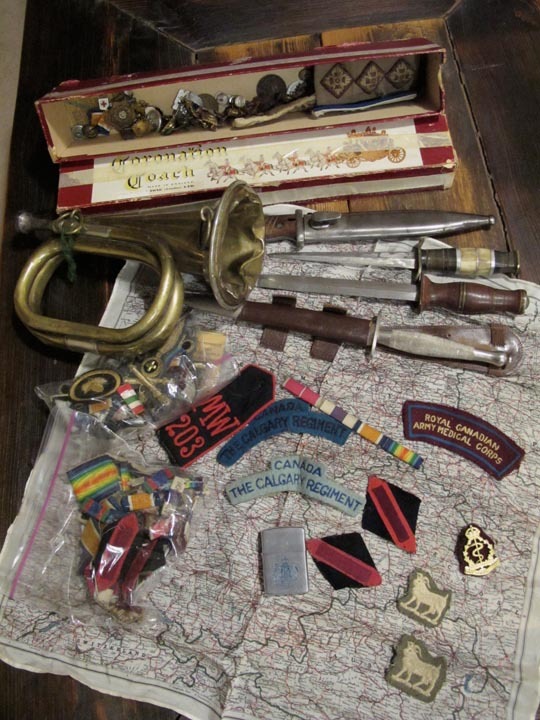 The treasure trove, including the First World War bugle and the armoured corps white ram badges. 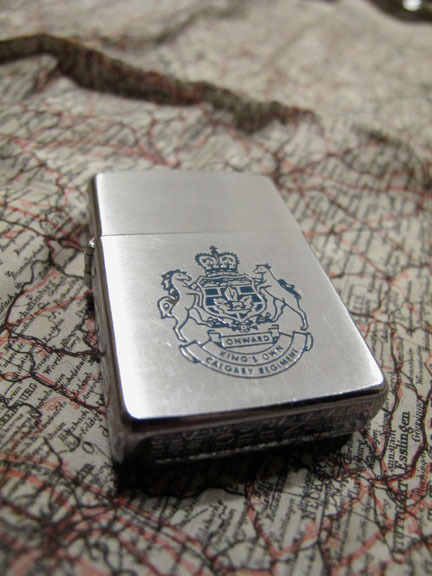 Doc Alexander’s King’s Own Calgary Regiment Zippo lighter, 1950. 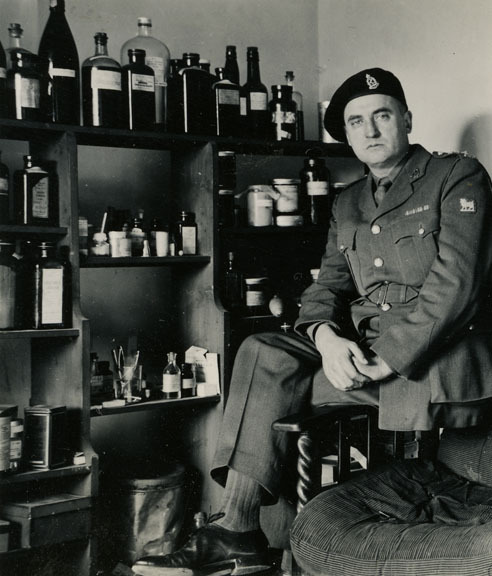 Doc Alexander in his Regimental Aid Post. Note the white ram badge on his arm. April 30: All wheeled vehicles left this morning for Annon in Scotland. Jim and Mac are both gone. The rest of us are wandering around like lost sheep. May 1: We all leave by train tomorrow. Ralph, Mike and I leave at 10 a.m. Bert leaves with second train about 10 p.m. We are all awfully anxious to get there now and to get settled down to what ever we are going to do.